The world is made up of wondrous chemicals that sometimes do pretty out-of-the-ordinary things. Here are seven places where minerals, carried by water, by heat, or by the actions of Mother Earth herself, left us with strange and wonderful sights. Looks ice cold, doesn't it? Actually, the water is quite warm at the Pamukkale terraces in Turkey, but swimming in it is restricted to preserve the environment at this UNESCO World Heritage site. The white formations are deposits of the mineral travertine from hot spring water that built up into a series of dams, making the terraced pools what they are. See more pictures of Pamukkale and of other terraces formed by various mineral flows. 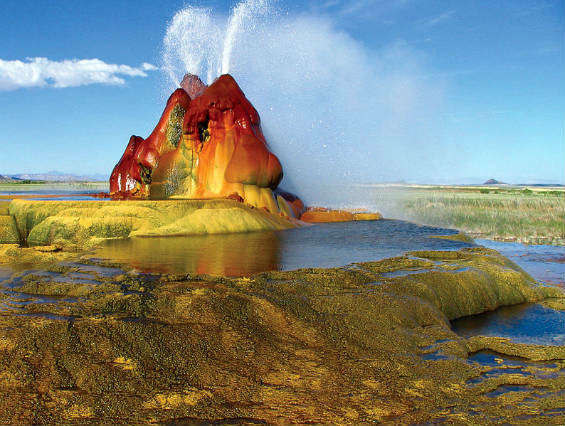 The geothermal geyser called the Fly Geyser is on private land in the Hualapai Valley near Gerlach, Nevada. The colors are due to different mineral deposits as well as algae growing on it. The geyser broke through the surface of the land in the 1960s, in a weak spot where a water well had been drilled decades earlier. It has since built up a mineral cone several meters high with multiple water geysers constantly spewing over 74 acres. The owners of Fly Ranch do not welcome sightseers, and do not want to sell the parcel on which the geyser sits. 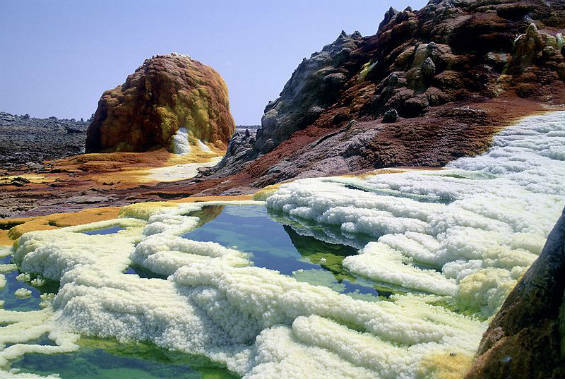 Dallol is a huge area in Ethiopia that shows what happens when a volcano erupting from below meets water and concentrated minerals at the surface. An explosive eruption left a volcanic crater, mineral springs, geysers, acidic pools, salt pillars, and other strange formations in the middle of the Danokil Desert, 150 feet below sea level. Sulfur, iron oxide, salt, and other minerals give these formations otherworldly colors. Due to harsh conditions (the average temperature of the area is over 90 degrees! ), inaccessibility, and political tensions, Dallol has never been designated as a National Park, nor does it have any kind of reserved status. Photograph by Wikipedia user Hervé Sthioul. 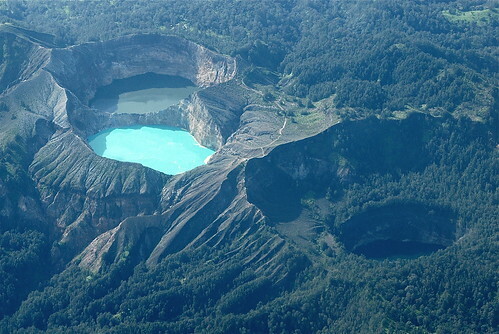 The Kelimutu volcanic peak on Flores Island in Indonesia has three crater lakes which each have water of a different color, thanks to the minerals they contain and the ways those minerals interact with volcanic gasses bubbling up from below. Tiwu Ata Mbupu is blue, Tiwu Nuwa Muri Koo Fai is green, and Tiwu Ata Polo is often red (although it looks very dark here). Each lake has a different legend and spiritual meaning. Photograph by Flickr user whl.travel. Solutional limestone cave systems feature the mineral deposits that we all learned about in grade school: stalactites and stalagmites. Meramec Caverns near Stanton, Missouri, is a particularly photogenic example of a cave system formed when water leached limestone away from the sandstone surrounding it. The resulting open space, formed over hundreds of millions of years, is partially (and slowly) filling up with limestone deposits forming the stalactites growing down from above and stalagmites building up from below. Photograph by Flickr user Tydence Davis. In New Mexico, Lechuguilla Cave and Carlsbad Caverns are both a different kind of solutional cave: they were formed by sulfurous acids rising from below. 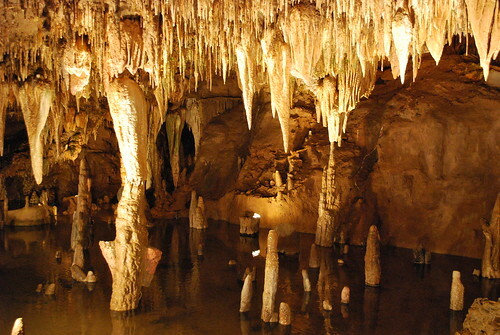 The minerals from the acidic fumes leave amazing and fragile gypsum and sulfur formations such as crystals, chandeliers, soda straws, and cave pearls. Although Carlsbad Caverns is a major tourist draw, the more recently-mapped Lechuguilla Cave is off-limits to visitors in order to preserve the environment. 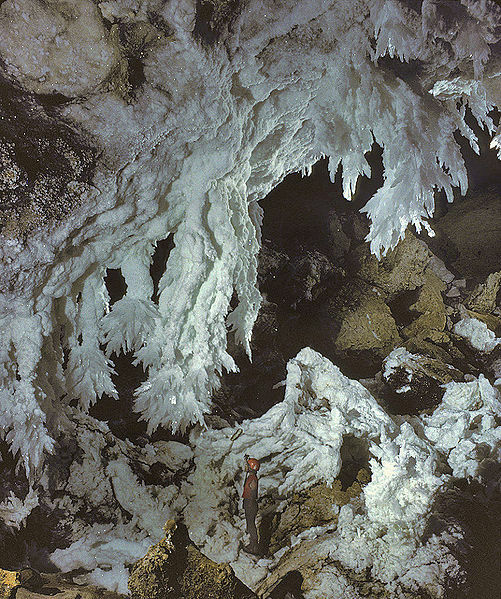 Shown here is a gypsum formation called the Chandelier Ballroom at Lechuguilla Cave. Photograph by wikipedia user Dave Bunnell. Ijen volcano complex in East Java is a group of stratovolcanoes in one huge caldera. The cones of these volcanoes are a result of lava layers that spew and cool over a long series of eruptions. 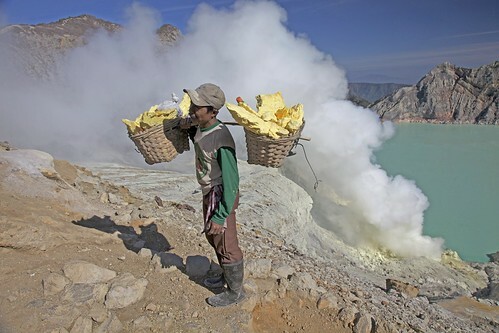 At Ijen, several volcanic craters accompany these cones, with a sulfur and acid content that repels all but the hardiest of humans. However, people take the risk to mine the abundant sulfur from these craters. It's a dangerous but relatively lucrative job. Photograph by Flickr user Jean-Marie Hullot. This is by no means a comprehensive list of mineral formations, but rather a few examples of how these things come about. Let us know if you have a favorite not included here!